To begin with, an apology. I haven’t been around these parts much recently. My absence has been due to nothing more than running out of material, having reviewed all the books in my own collection I thought worth the effort. I’ve bought three cricket books this year – Wisden (of course), an old Benson & Hedges annual, and a Denis Compton biography that I haven’t got round to starting yet. 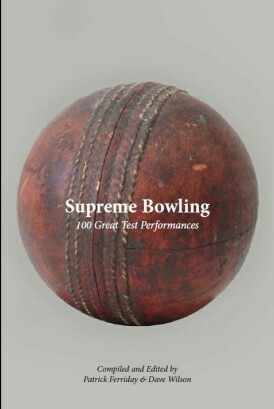 I was, though, pleased to receive my copy of this title, a logical sequel to Masterly Batting, and compiled on the same lines – an attempt to grade and tell the story of the hundred greatest bowling performances in Test cricket. The format is the same as before – the top 100 appear in reverse order, in three sections. Part one, ‘Foothills’ outlines numbers 100 to 51, giving each a page, or around 500 words to each performance. The second, ‘Ascent’, covers numbers 50 to 26,with two pages – and finally the meatiest section is the ‘Pinnacle’ – the top twenty five, around six or seven pages (the lengths do vary slightly) followed by the match scorecard. Before all this comes a lengthy and detailed introduction, in which the editors attempt to explain just why these hundred performances came to be chosen. While I can understand why they have been so thorough, I must admit that I was impatient to get to the cricket and so it may be that these details will prove of more interest to other readers – perhaps those who work with data analysis, spreadsheets and so on. I must give full marks, though, for their determination to avert or fend off counter-arguments as the list of those chosen. Something like twenty-five writers contribute to this book, and they include a couple who would be classed as cricket writing royalty at CricketWeb Towers – David Frith and Stephen Chalke – along with a number of well-known writers, such as Dileep Premachandran, Ken Piesse and Dan Waddell. Accordingly, the writing style varies from chapter to chapter, but not so much that the effect is jarring. I particularly liked Andy Baynton-Power pitching Glenn McGrath’s story as a film script, and James Mettyear interspersing his account of Bob Willis’s Headingley classic with Dylan titles. A somewhat confusing entry appears at number 78 though. Credited to Sean Ehlers, it appears to have been penned by Ian Johnson himself, as it’s written in the first person. Apologies to all concerned if I’ve missed the rationale behind this one. I have some reservations: both Michael Holding and Jim Laker appear twice, for their first and second innings efforts in the same match – I’m sure you can guess which matches they were. Given that Bob Massie and Narendra Hirwani both took eight wickets in each innings of the same Test (both on debut, incidentally) and each of these is covered within a single chapter, that strikes me as an indulgence too far. At least Laker gets two authors, while David Tossell is tasked with avoiding repetition of material from his excellent book,’Grovel!’ on the 1976 England v West Indies series. I also spotted a few ‘typos’ – within the script, harmless enough – but we also have one on the scorecard for the number one match. 304 should be 340, an unsatisfactory ending I thought, as it took me a few minutes to work out what had happened. I don’t want to detract too much from a book which I enjoyed a great deal – and which, incidentally, looks perfect on the bookshelf next to its older sibling. At £15 it represents excellent value for money, and I sincerely hope it does well. Final thoughts – is Curtley Ambrose the most destructive bowler of all time? He has two entries in the top ten. Just outside that august company we find one from Morne Morkel which I’d completely forgotten – as Rodney Ulyate says, “contributors weren’t exactly lining up to take this one” and one of the few which didn’t result in a win, which perhaps makes it all the more unlikely to find it ranked so high. The number one performance is one which I hadn’t expected, but having read the chapter in question, I don’t feel qualified to argue. Plenty of food for thought here, and congratulations to all concerned.